Reliable sources for local breeds in Hessen did not exist. There was no state breeding as it was all based on the local farmers in the former centuries. The princely stables bred with imported breeds according to the period's fashion and for their own use only, creating no unique breed type. The only exception was the Beberbeck stud which existed until 1929 and had a good name for noble half-breeds. Hessen is a breeding region in Germany along with Westphalia and Hanover. In fact, Hessen ranks 4th in warmblood breeding. It boasts more than 4,000 broodmares and more than 60 state stallions. This information is based on the official Hessian State Stud at Dillenburg. 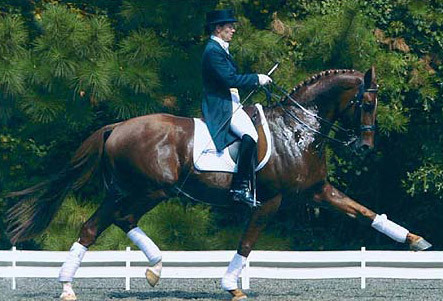 The Hessen Warmblood is an excellent German warmblood. In the 1960s the heavier breed of Hessen an effort was made to breed a more refined and lighter breed to be used as a sport horse. Trakenher, Hanoverian, Holsteiner and Arabian blood has been infused in an effort to achieve this end. The Hessen is able to carry all types of riders from lightweight to heavyweight. They have a sweet temperament, are elegant in their way of going, willing, athletic, have great endurance and are intelligent.